My vocation is Software Engineer, and my title is usually something along the lines of “Senior Software Architect.” This means I’m the one who designs the software. Because I’m a big believer in design-and-build (means the architect always participates in coding), I also do a lot of the development and testing as well. I enjoy my work so much that I read and write code in my spare time. This might seem odd to some people, working for free at home, and doing your work as your hobby. I feel lucky that I enjoy my work that much. My primary recreation, as far as it is different from the above, is backcountry travel of various sorts. I started, like most people, as a hiker. The simple act of walking. This led to travel over more difficult terrain, loftier goals, and necessitated the use of different modes of travel. 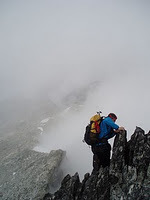 To climb a mountain I had to learn glacier travel, rock climbing, navigation, and mountaineering skills. To travel in winter I had to learn to ski, ice climb, and protect myself from avalanches. The act of learning is ongoing; sailing, canoeing and kayaking are on the agenda. My avocation is Search and Rescue. In January 2000 I joined a SAR team. At the time I was frustrated with volunteering for various organizations and needed a simple way to feel useful, and to give back to society. SAR was that opportunity. My skills at backcountry travel were a good fit for the task of finding and helping lost and injured people in BC‘s wilderness. Late in 2010 I became a SAR manager, responsible for directing a search. In the years since I have joined, I have spent thousands of hours training and hundreds of hours searching, and it has been one of the most rewarding pursuits I have ever undertaken. This blog is an expression of these three aspects of my life, as much as they are related. Being a software engineer, I design systems and workflows. I am sensitive to the patterns in life, in as much as they are expressed in software to accomplish a task. I believe my analytical experience gives me some insight into the activity of backcountry recreation, with it’s gadgets, gears, skills, and processes, and into SAR with it’s organized and systematic approach to finding and rescuing lost persons. I hope you enjoy reading what I write. Feel free to contact me with any questions.